THPBlog: W.M Beaty & Associates to log near Eagle Lake. W.M Beaty & Associates to log near Eagle Lake. 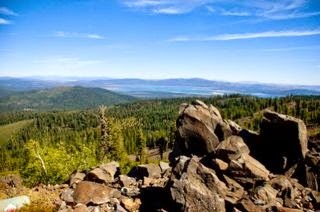 This THP is about a dozen miles NW of Susanville, CA and about 2 miles west of Eagle Lake in Eastern Lassen County. W.M Beaty & Associates is planning a tractor based logging operation in white fir and ponderosa pine forests. Over 985 feet of seasonal road construction is planned to disconnect the road system from a class III watercourse. A goshawk was reported in section 12, a bald eagle was reported in section 8, a red tailed hawk nest was reported in section 5, and there is a CA spotted owl territory in section 12. More information is available on the THP Tracking Center website.